Spoiler alert: My answer is going to be NO. I do think it’s interesting, though, that Jerry Seinfeld was, during the Must See TV era that his show and Friends dominated, and has continued to be, convinced that Friends “stole” their show premise from his hit. I like that Seinfeld is so competitive when it comes to his art — I’m sure that’s what’s fueled him toward such excellence in his work — but I can’t believe he’d really believe this. Aside from both shows being about single, unrelated people hanging out in New York City — hardly a unique description — these two shows couldn’t be more different. In fact, I see them as Platonic opposites. 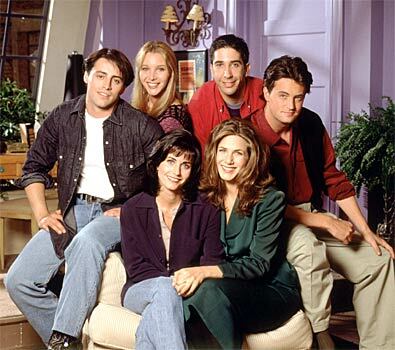 Because of the similarities in their basic stats — sitcom, group of friends, Manhattan, professional-class, white — their differences are more obvious. Friends is really about friends — that is, earnest feelings of affection among people who have formed what so many trend articles afterwards called “an urban family.” They loved each other so damn much that they engaged in nearly every permutation of straight romance that could happen among the six of them without things getting really creepy. Friends was about that magical time in life when your friends are the most important people in your life, before you settle down and have a family of your own, blah blah blah. Friends is literally feel-good television. Seinfeld was a reflection of cynical times, not an antidote to them. Seinfeld did not explore the bonds among its characters; it assumed them for the purposes of pure comedy. (A person could wonder: Why the hell do these people keep hanging out together? Specifically: What’s Elaine’s excuse?) Where Friends says something like, “All we need is love,” Seinfeld says, “We better stop having feelings before anyone gets hurt.” Mind you, that’s what makes Seinfeld great, what makes it more artful than Friends — which is genuinely funny and touching, but not paradigm-shifting. Seinfeld rewrote how sitcoms were written, making room for unsympathetic characters, petty grievances, and plots wound far tighter than anyone had known they could be in 22 minutes. Watch the two finales for all the evidence you could want. Friends will warm your heart, but you’ll feel a little emotionally manipulated afterwards, like you got your happy ending without totally earning it. Seinfeld will annoy you, disappoint you, and make you think: Was all this time I spent watching this show worth it? But at least you’ll be thinking. It’s worth noting, however, that Seinfeld, Friends, and Mad About You were all supposed to take place in the same fictional Manhattan. The writers of the three shows made that clear when they made Friends’ Phoebe the twin sister of Ursula, the waitress character Lisa Kudrow was already playing on Mad About You, and then later on Seinfeld, when the show took note of the sub-lease arrangement between Mad About You’s Paul Buckman (Paul Reiser) and Seinfeld’s Kramer. It also seems clear that all three shows were designed to cater to the same demographic. It is also very clear that the creators of Friends saw an opportunity to capitalize on the success of Seinfeld without the all the drudgery of working hard at creating something original. Not to mention the obvious risk involved in creating their own product. That….and the constantly whining Ross character….are the main reasons I could not stomach that putrid show. To list all the reasons why it was a Seinfeld rip off would be an insult to intelligence by stating what is already so completely obvious. Seinfeld??? Thumbs up! Friend’s??? No…just no. Was it a rip off?? Of course it was! Friend’s was definitely a Seinfeld rip off. I don’t understand why anyone would NOT think that lame show was a Seinfeld rip off. The very first time I watched it I thought to myself….”hmmmm, this seems a little familiar.” One of the main reasons I hated Friend’s. But it most certainly wasn’t the only reason I hated that putrid show. Friends is to Seinfeld what the monkees were to The Beatles. A cleaned-up copy of the form removing anything that may be challenging emotionally or intellectually from the content.